Costa Brava villas with pools, luxury cottages and bungalows, holiday homes to rent, letting accommodation, houses for hire with private pool for family holidays. 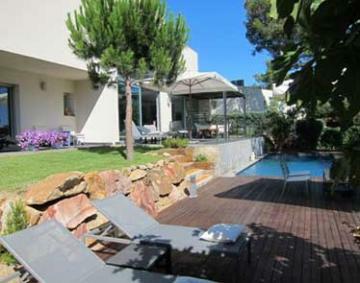 A superb villa with pool selection on the stunning Costa Brava, Spain. Many of our Costa Brava villas command panoramic sea views and there are even some within walking distance of the beach. The Costa Brava lies in the autonomous region of Catalonia and stretches from Cape Creus to the mouth of the river Tordera. There is a diverse mountainous hinterland with fertile valleys and fast flowing streams and numerous peaks over 2,000 metres. The coastline is beautiful with wonderful sandy coves flanked by dramatic, ochre cliffs, lush in vegetation and lapped by the warm Mediterranean sea. There are a number of renowned resorts along the coast from Blanes in the south to Portbou in the north with S’Agaro, Tossa de Mar, Begur, Cadaques and Portlligat in between. We have 94 villas in Costa Brava. There is much to see in the area including the house of Salvador Dali at Cadaques, Dali’s amazing surreal art museum at Figueres and the contemporary art museum in Barcelona. 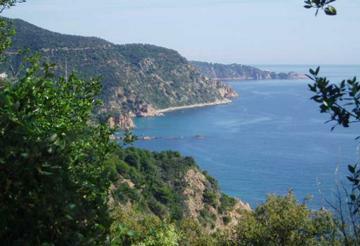 To find out more about what to see and do in the Costa Brava follow the underlined text Costa Brava attractions. There are many events in this vibrant region, to find out more follow the underlined text for Catalonia holiday events. Being on the coast there is plenty of fresh fish and seafood in the Costa Brava with anchovies being one of the big local specialities. There is also plenty of excellent meat and fresh fruit and vegetables. The Costa Brava is a great place for eating out with a good choice of family run restaurants, many in stunning settings overlooking the sea, with typical Spanish tapas and huge platters of aromatic paella along with beautiful fresh fish and seafood and delicious meat. Restaurant facilities cater superbly for all the family. There is only one place to go for shopping on the Costa Brava and that is Barcelona, where you can shop till you drop. There are many water sports possibilities all along the Costa Brava, including snorkelling and diving as well as windsurfing, sailing and canoeing. There are some very nice areas for walking in woodland on the hills near the coast, where mountain biking is also possible. The climate is wonderfully warm with moderate rainfall, you will get plenty of use of the pool at your villa here. It is easy to get to the Costa Brava either plane to Gerona (GRO) which is the nearest to most of the coastal villas in the Costa Brava or alternatively Barcelona (BCN). There is a good choice of airlines including low-cost services from Easyjet, Jet2, Ryanair and Monarch. Many people choose to drive as motorway access through France and Spain is good. The beaches of the Costa Brava are arguably the main attraction of the area. To the north, there are long wide sandy stretches for as far as the eye can see and further south there are charming bays like Tossa de Mar and pretty coves such as Tamariu. The beaches tend to slope gently and there is little in the way of currents so it's a very good place for children. There are a number films which feature Barcelona, of which All about my mother by Pedro Almodovar won an Oscar. There is also the Woody Allen film, Vicky Cristina Barcelona with Penelope Cruz. An old classic is Pandora and the flying Dutchman centred around Tossa de Mar. It's actually a book about football which is the major work set in Costa Brava, A People's Passion by Jimmy Burns is all about the history of Barcelona football club. The classic is Tirant lo Blanc by Joanot Martorell which is of Don Quijote proportions. The shadow of the wind is a fascinating novel by Carlos Ruiz Zafon based in Barcelona. The holiday houses for rent in the Costa Brava are often set on hillsides overlooking the sea, we make sure that they are child-friendly. Others are close to the beach and some are architect designed so are quite distinctive in style and around Roses there are some with moorings, right on the sea. A little inland there are some lovely converted stone farm houses with plenty of character. Let us help you make the perfect choice for your Costa Brava villa holiday, consult our experts for Costa Brava villas.